Within People Inc. an employee is awarded an allowance for each category of absence that they are entitled to take. 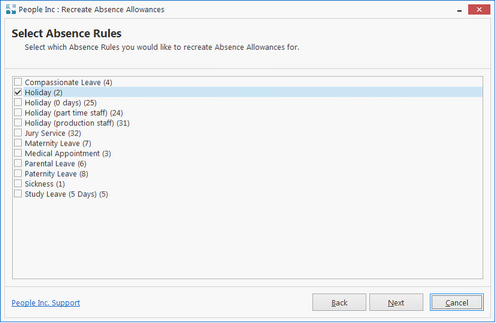 The details of these allowances are defined in an associated rule that can be configured in the Absence Rules screen. Allowances are usually created to last for a complete year and a new allowance needs to be created for employees for each year. Absence Rules can be configured so that the allowance is automatically created when an attempt is made to book against it, this is typically acceptable in the case of sickness but not for other types of rule which are awarded on a discretionary basis. 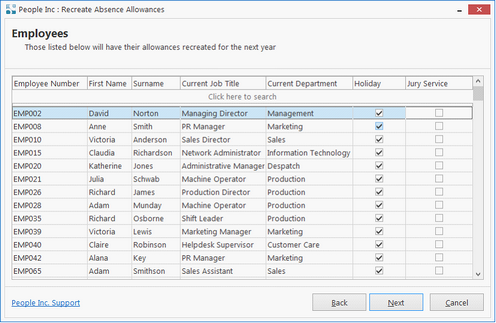 This wizard allows for the re-creation of Absence Allowances based on an employee's existing allowances. Most changes made with wizards will affect information held in a number of different areas of the system, and the changes may affect a large number of records. It is not normally possible to ‘un-do’ these changes without identifying the records that have been changed (or removed) and reverting the changes manually. This can be a time-consuming and painstaking task. To undo the actions of this wizard each employee record that has been affected must be identified, for each employee navigate to the Absence Allowances screen and remove the allowance that has been created. It is important that allowance that have Absence History records booked against them are not removed unless the Absence History record is assigned to a different allowance. This wizard will create an entry in the Action List linked to each employee if an issue is encountered when recreating the allowance. This entry will provide details of the issue. 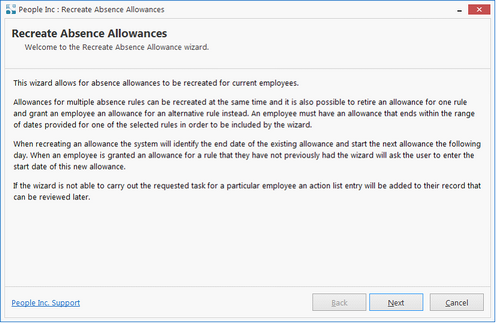 Click on the entry in the list of wizards to run the Recreate Absence Allowances wizard; the following screen is displayed. 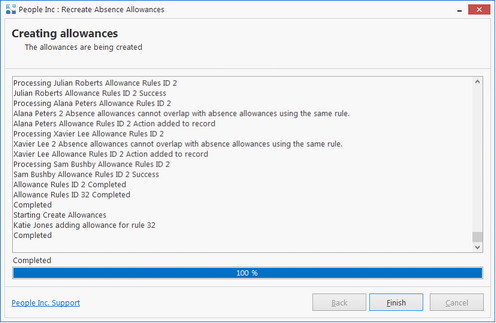 Step 1: Select the absence rules that allowances should be recreated for. It is possible to select multiple rules. Step 2: Specify the range of end dates the allowance to be recreated have. The allowance with the latest end date within the range entered will be recreated. Step 3: Select which allowances for be recreated for which employees. This page in the wizard will display all the employees that have an allowance for the identified rules that ends between the range of dates entered in the previous stage. 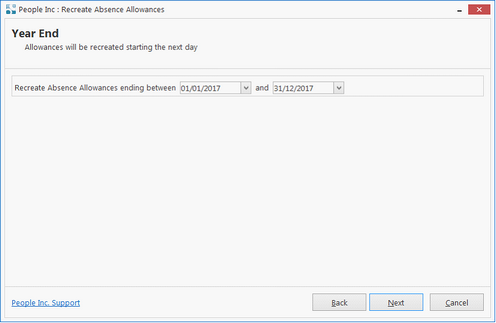 When the page loads a tick will appear in the absence rule column where the employee has an existing allowance for that rule, removing the tick from this column will prevent the allowance from being recreated. Where an employee does not have an existing allowance for the selected rule it is possible for the wizard to create one. To do this add a tick in the corresponding rules column, the wizard will prompt for the start date of this new allowance and the end date will be a year after that date. Step 4: Confirm that the information is correct and update the system. Clicking on Yes will cause the records to be updated and/or created. This action can be undone by manually removing the allowances from each employee.